Do you live in an older home with an older electrical panel? Has your dated electrical system had several add-ons and fixes over the years leaving you concerned about reliability? Here’s the dilemma – electrical connections and components do not get better with age! Therefore, it is a smart idea to have the electrical panel within your home evaluated for safety. An infrared scan by a qualified thermographer is simple, doesn’t take much time, and won’t break your wallet. Resistance is the key . . . Increased resistance and heat are the primary reasons most electrical components fail. In electrical systems increased resistance can be caused by component age, fatigue, oxidation, wear, loose connections, or poor installation. Infrared cameras detect this heat. 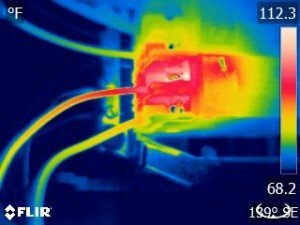 Because most things electrical tend to get hot before they fail, an infrared inspection is an important diagnostic technology that can detect early failures in electrical systems. This is especially vital when visual clues may not be apparent. The procedure . . . In order for infrared to be of value, the house electrical system must be energized or put under a load; ideally this is normal operating load. And when a load is put on an electrical circuit, heat occurs. Simply said, the thermographer will need to turn on ALL 110-volt circuits (lights, exhaust fans, small appliances, etc.) and ALL 220-volt circuits (electric oven/range, electric dryer, electric furnace/heat pump, etc.) in the house – ideally putting a minimum 40% load on whole electrical system. With the panel cover removed, the thermographer will then use the IR camera to scan the components and connections within the panel. A loaded circuit that is properly behaving will not have a heat signature OR have even heat distribution. A problem area, however, shows up as a “hot spot” with a predictable thermal pattern that a trained IR thermographer can interpret and rate. For example, a loose breaker connection in infrared produces a signature thermal gradient traveling from the “hot” breaker connection along a “cooler” electrical cable. Who is qualified for the job? An electrical IR thermographer should be well established, fully insured, have a minimum of Level 2 infrared certification. 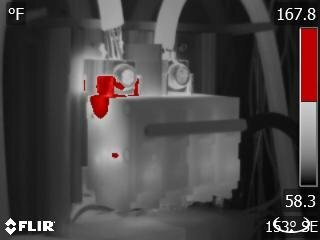 The infrared camera used should have sufficient resolution to provide clear imagery of inspected components. 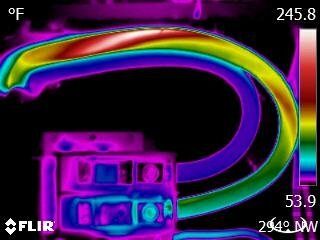 The thermographer should be experienced with quantitative thermography and thus be able to accurately pinpoint problem electrical anomalies with measurable temperatures. The infrared company should produce a quality report that references an accepted industry-standard criteria that can be easily interpreted by a licensed electrician. The cost of an IR scan is small in comparison to its benefits. Return on investment is very easy to justify! Contact Puget Sound Infrared to set up an ElectricIR scan appointment at your home today. Authorized “ElectricIR” Contractor with United Infrared, Inc.
© 2019 Puget Sound Infrared. All rights reserved. | Website by A Little Piece of the Web using the Divi Theme by Elegant Themes. Powered by WordPress.